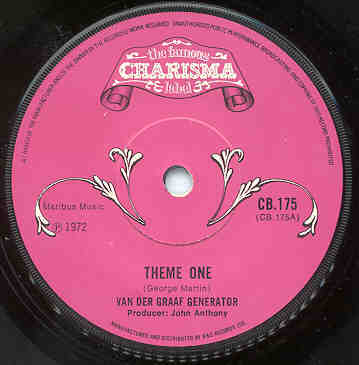 This series was begun by Charisma's original distributor, B&C Records. The two labels shared the series until mid-1972. Where a specific month of release is noted, the information comes from one of various British music industry publications. Where a specific day of release is listed, it is taken from the label of a promotional copy of the single. These dates are listed the same way they appear, which is in the British style of day/month/year; i.e. "9.6.72" means June 9th, 1972. NUMBER ARTIST A-SIDE/B-SIDE DATE ? The above single exists with two different B-sides. "(Here Comes) The Crunch" is a completely different recording and arrangement of the same song which appears as "The Crunch" on CB 271. The above two listings are correct -- the number CB 411 was indeed used twice. The Rick Wakeman single was the last one released through Phonogram, with The Hank Wangford Band being among the first released through Virgin. This page updated on August 10, 2013. Copyright 2013 - 2018 Mark J. Moerman. This information may not be reposted without permission and proper acknowledgement.